The worlds of beer and gin have found much common ground in recent years, and not just because the latter industry is enjoying the sort of time in the spotlight increasingly enjoyed by craft brewers. Whether it's been Young Henrys using hops in its Noble Cut Gin or Hargreaves Hill teaming up with Four Pillars for the excellent annual Gin Barrel Gose, there's been plenty of crossover. 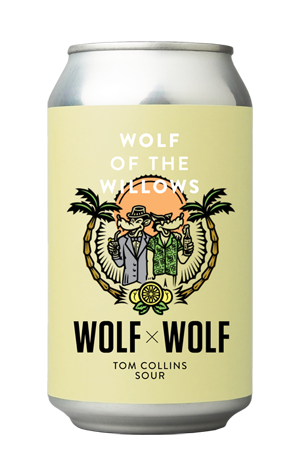 And now Wolf Of The Willows is getting in on the game in partnership with Patient Wolf, a Brunswick based distiller. The two came together to create a beer-based spin on the classic Tom Collins cocktail for the 2018 GABS festival. Starting out with a sour beer from which to build, they added botanicals including juniper berries, coriander seeds and tonka beans. The gin like aromatics shine through clearly, but not obtrusively, above a sour that's gentle rather than bracing, possessing a cleansing tang rather than puckering the palate. There's a pleasant lemony malt sweetness holding things together too in what's really a rather delightful, slightly left of centre booze hybrid.